Whether you drive a car or ride a bike, there’s no question that street safety must improve here in California. In 2009, nearly 1,300 people were killed in car accidents and 100 were killed in bicycle accidents here in California alone. According to the Fatality Analysis Reporting System, California mourns more than 3,000 traffic deaths each year if you add pedestrians and motorcycles to the mix. Fortunately, reports the San Jose Mercury News, that could all change thanks to a series of street makeovers throughout the Bay Area. Cities throughout California have proposed traffic plans designed to ease congestion and make streets safer by reducing the number of vehicle lanes in favor of pedestrian spaces and bicycle lanes. Of course, as with any measure that will mess with peoples’ commutes, these measures have quickly become contentious topics of debate. Critics say that fewer vehicle lanes will lead to more traffic with little benefit to city dwellers. Proponents, on the other hand, point to studies that show a direct relationship between increased bike ridership and lives saved. San Jose: High-speed one-way roads on Fourth and St. James streets will be converted to two-way roads to bring speeds down and facilitate crosswalk traffic. San Francisco: Traffic lights on Valencia Street now match the speed of cyclists, not cars. The city has also proposed cross-town bicycle lanes, and new bike lanes on Oak and Fell Streets. Santa Clara: The city will remove one lane on Pruneridge Avenue to make way for a new bike lane. These are the major development projects currently in the works. But a handful of cities across California, including Oakland, Hayward, Pleasanton, San Mateo and Redwood City, are also vamping up efforts to improve bicycle and vehicle safety. 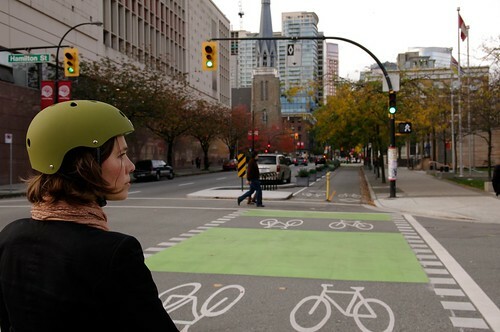 Are you in favor of these bicycle friendly efforts? Let us know what you think in the comments section below, or on our Facebook page.